1 Melt the butter in a large saucepan. Add the shallot and cook over a low heat, stirring occasionally, for 5 minutes. Turn the heat up, stir in the spinach, season with salt and cook for a few minutes, until wilted. Lift out of the pan with tongs and drain in a sieve to remove any excess water. 2 Meanwhile, cook the pasta in a large pan of salted, boiling water until al dente. 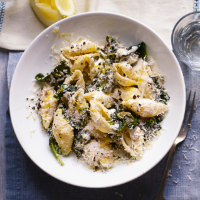 Put the cream, ricotta and ½ of the lemon zest and parmesan into a serving dish. Season well, then beat until smooth and combined. 3 Drain the pasta and stir into the ricotta mixture. Add the spinach, toss lightly, and serve immediately, scattered with the remaining zest and cheese.